Aromatic flavors of rose and orange blossom are still strong reminders of my childhood. I didn’t eat like the “other kids” on the block. I grew up with exotic Sephardic dishes of fasulye (Turkish green beans) and fideo (a Sephardic pasta dish). I was introduced to smoked fish before I could walk and learned to roll grape leaves as soon as I could sit up. Perfumed sweets from the Mediterranean bakery down the street were normal dessert fare in our home, and we liked it that way. I will never forget my first bite of rose water cookies, and ever since I have been hooked on the unique flavor. Ever since those cookies of my childhood, I always make sure to have a bottle of rose water and orange blossom water in the fridge for adding to special dishes when I can. Or, in this case, for sangria. A note about both rosewater and orange blossom: A little bit truly goes a long way, so don’t add too much! But it does add a lovely, subtle note that makes those glasses go down easy. Another note about sangria in general: You can really use any fruit you like, depending on your tastes, what’s in season, or what happens to be in the freezer. 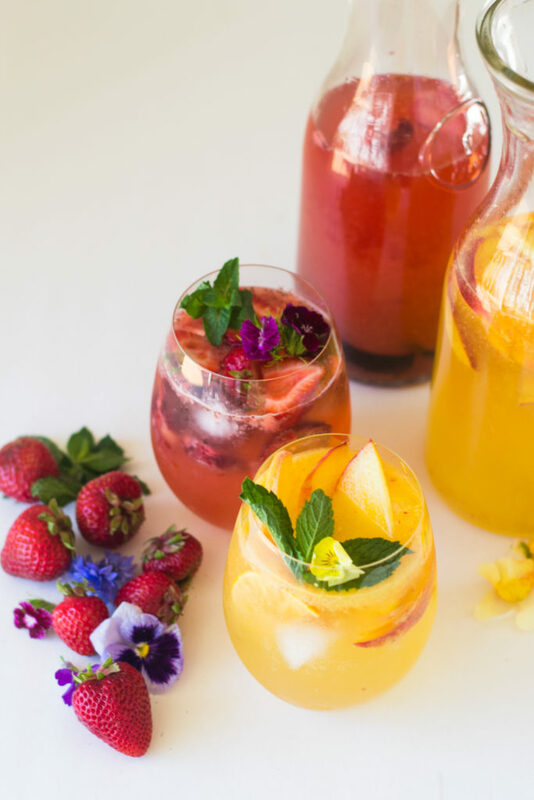 Whatever fruit you chose, cheers to summer with a glass of floral sangria. To make fresh peach puree, roughly chop 1 peach and add it to a blender or food processor with a splash of water (about 2 Tbsp) and pulse until smooth. Pour into airtight container until ready to use. Next, make your simple syrup. Combine ½ cup sugar and ½ cup water in a saucepan and bring to a boil. Turn down the heat and simmer for a few minutes, until the sugar is dissolved. Take off the heat and let cool. You’ll only need ¼ cup for this recipe, so store the rest in a jar in the refrigerator for up to 1 month. 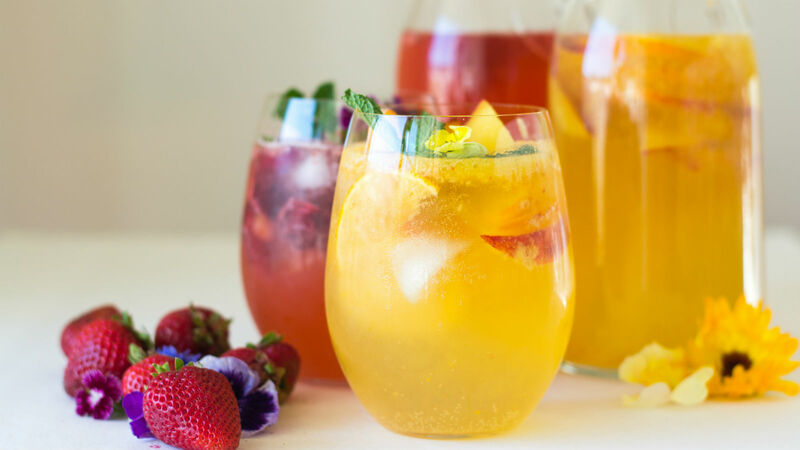 For the sangria, in a tall pitcher, add in ½ cup of the peach puree, sliced peach, rum, ¼ cup simple syrup, orange blossom water, and white wine. Use a long handle to stir everything together and allow to sit in the refrigerator for at least 4 hours. When ready to serve, pour into glasses and top with either sparkling wine or sparkling water (I used La Croix sparkling water). To a blender or food processor, add the frozen strawberries and about 2 Tbsp water and blend until smooth. Pour into airtight container until ready to use. In a tall pitcher, add in ½ cup of the strawberry puree, ¼ cup of simple syrup, fresh strawberries, plum, rum, rose water, and rosé wine. Use a tall handle to stir everything together and allow to sit in the refrigerator for at least 4 hours so flavors can blend. When ready to serve, pour into glasses and top with either sparkling water or sparkling wine. This half-frozen sweet treat with Middle Eastern flavors is bound to impress any dinner guests.